Notes to readers: This paper described an overall computer design process based on multi-level simulation. The methods described are of historical interest because they build on the ACS-1's architectural and logic-level simulation capabilities to create comprehensive design for a design process enabling error-checking at each level of design and insurance of design consistency at the various levels. This design process would likely have been implemented at IBM had the ACS-1 gone into production. A version of this paper was presented for Lynn (by others) at a major internal IBM simulation conference in 1969 (after Lynn had left IBM), and was well received and widely commented upon at that conference. It is likely that this work had impact upon later trends in computer CAD. This work also helped inspire Lynn's later multi-level design methodology work in VLSI microelectronics. This paper has been officially declassified by IBM, and Lynn Conway has been granted a worldwide license to distribute it for historical and academic purposes. For more background and context on this paper, refer to Lynn Conway's ACS-Archive Front-Matter. 1. ACS AP #66-022, ACS Simulation Technique, D. P. Rozenberg, L. Conway, R. H. Riekert, March 15, 1966. 2. ACS AP #67-115, MPM Timing Simulation, L. Conway, August 25, 1967. 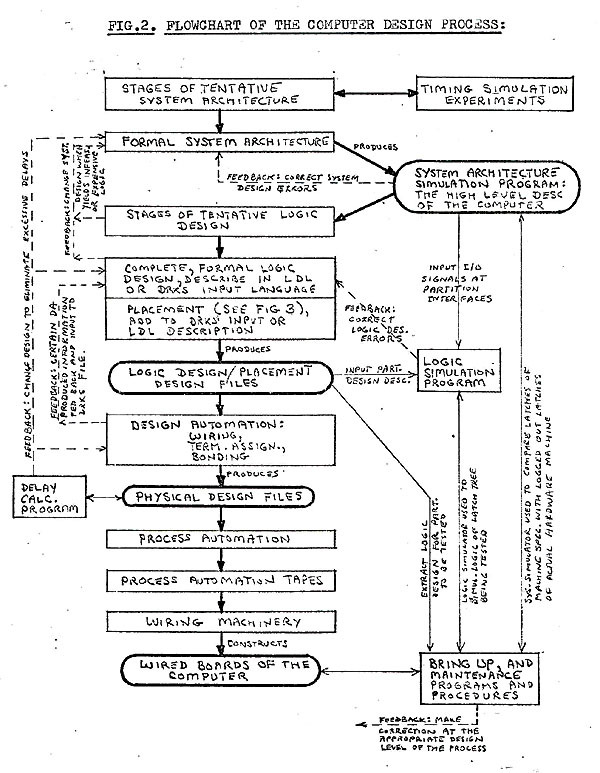 3.A Proposed Logic Simulation System, L. Conway, October 31, 1967. 4. System Simulation Program in ACS Engineering, P. Shivdasani, April 24, 1968. 5.Proposal for a Design Procedure for the ACS System, Uno R. Kodres, July 19, 1968 (memorandum to D. P. Rozenberg). 6.Preliminary Description of Traceback and Simulation in ACS Fault Isolation, D. G. Keehn, August, 1968. For many years, computer designers have proposed the use of various levels of simulation for design specification, verification and evaluation. Simulation and automation have been applied to some phases of the design process in a number of past projects. At the present time, in ACS, we feel that we have sufficient practical experience in system simulation and design automation to propose a workable system plan for the whole computer design process. This plan has as its key element the specification of the system level design in a high-level simulator. All following phases of design are viewed as implementations of this system specification. Details of this plan are presented including initial design studies using timing simulation, design specification in a high-level simulator, logic design verification by comparing two levels of simulation, design automation and finally, hardware checkout and maintenance. Design automation eliminates routine human effort in the later design phases. Simulation allows creative human effort where it is important -- in the initial system level planning and evaluation. Rather than being merely a sideline in the design process, simulation can be and should be viewed as the natural medium of expression of the computer designer. A designer who can quickly generate working models of his ideas can get the feedback necessary for real design improvements. Adequate programming tools are now available to the designer for this purpose. This memorandum presents a brief description of all the phases and components of the design process as it might exist in ACS. Much of this material is well established practice, and thus the memorandum could serve as an introductory tutorial document on this subject. (i) The careful planning of the design process itself is as necessary for success of the project as is the careful planning of the computer design. The design process should be planned as one integrated system. If the separate phases are planned by different groups of people, the result will be an ineffective overall plan with serious difficulties at the interfaces of the phases. (ii) The plans produced should be carefully documented and maintained and made available to all designers. A common terminology would then develop for all the many design phases, simulation and design auto-mation programs, design languages, etc., and better understanding and communication would develop across design group boundaries. in the high-level simulator and maintained throughout later phases of design. The design process described in this memorandum, including the above suggestions and the many programs implementing the process, is not just a speculation as to what might be a good way to do things in the distant future. There is considerable practical experience within ACS with the various components of the process. Let us now identify and define the fundamental stages of the overall design process. Then in the following sections of the memorandum each stage will be described in some detail. The design and production of the computer passes through four rather distinct stages. The stages are identified by their final production of a "formal description" of the computer in a particular "language". The output of one stage is the input to the succeeding stage. Each stage of the process may bethought of as implementing or redescribing the design of the prior stage in a lower level language. System Architecture: This is the planning of the structure and function of the computer system, developed from a consideration of predicted market conditions and technology. The plan is developed to the level of detail of system description such that the complete function of the system is specified. The formal description produced by the architecture group would be a running system level simulation program written in a high-level language. The design would be carefully partitioned along functional lines into formally specified partitions with fairly narrow interfaces between them. The architectural design would consist of (i) variables and arrays in the high-level language symbolizing the various registers and control latches of the machine, and (ii) algorithms in the language expressing the functioning of the control latches and the flow of data between registers and functional units on a cycle to cycle basis. Each stage produces a partitioned description of the machine design in a formal language, Each stage implements the design of the preceding stage. in a lower level language, with the design then containing more detail but performing the same function. The partitions can pass thru the process independantly. this design phase is a formal specification of the logic design, placement, and interconnections in the input language to the Design Record Keeping System (DRKS), which stores the design in a set of computer files. An alternative logic description language is now in development. Design Automation: In the design automation phase a set of computer programs operate upon the design filed in DRKS to produce as output a complete physical description of the computer. This is done on a board by board basis. 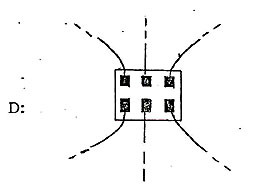 Note that in the DRKS system the various pads which must be interconnected to form a net are specified. However the actual route of wiring to connect these points is not. This wiring of all the nets on a board is computed by a wiring program. The pattern for bonding the wires to the pads is completed, and terminating resistors are assigned. 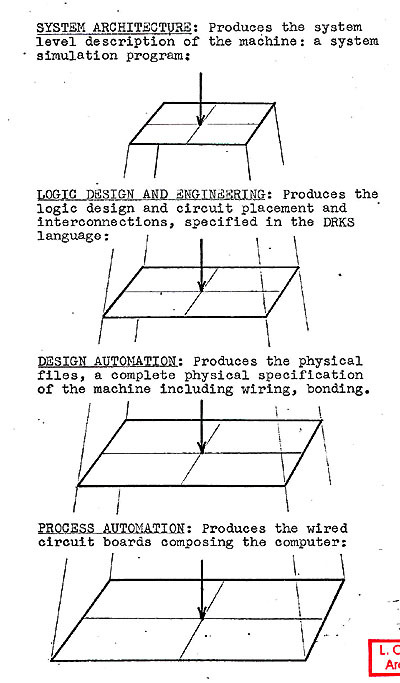 The result of this design automation phase is a set of computer files which contain the complete physical description of all the boards of which the computer is composed. Process Automation: We now have a complete physical description of all the boards. But how do we actually wire a board; what sequence of wire placements should we make? We must compute an orderly and feasible sequence of wire placements to be made by wiring machinery. The process automation programs operate on the physical files to produce a set of tapes which drive the wiring machinery through the proper sequence of operations to wire the boards of the computer. The output of this phase is the physical computer itself. We are now ready to study the design process in more detail. Figure 2 is a flow chart of the stages of the design process which indicates the various computer programs used at each stage and the interaction of the various stages. This flow chart serves as a basis for the detailed descriptions of each stage which follow in the later sections of this memorandum. The function of the system architecture phase of design is to produce a system-level specification of the machine. In the design process as described in this memorandum this specification is to be in the form of a running system simulation program. indicate that it is satisfactory. Then the design can be completely placed into a formal description. Now, how can one experiment with a tentative computer design? It turns out that this is well established in ACS --by using a timing simulation program. See Reference 2 for a description of a past timing simulation effort, and Reference 1 for the simulation technique used in that effort. the simulated computer, and the output of the simulator is a chart of the activities in the various machine registers, initiated by the instructions being processed, as a function of time. The detailed model of the proposed control structure can thus be tested quite accurately to predict performance and uncover design bottlenecks. (i) The system architects really want a simulator, believe in its value, and help in its production. (ii) The timing simulator is written in a high-level language. This will make algorithm production and documentation much easier than would assembly coding. Also, the timing simulator would be consistent with and a basis for the later system simulator. (iii) The architects participate in its writing. If the simulator writer(s) must form all the detailed algorithms specifying a tentative design, then the simulator will lag the design by many months, perhaps 4 to 6 months. However if the architects specify their tentative design in detail, then the coding of these designs would be a far simpler process and might lag specification by only one or two months. This simulator should be partitioned along the same lines as the machine and interfaces identified early in the design processes. Then the separate partitions could be designed independently with unspecified partitions modeled in the simulator by dummy subroutines which roughly approximate the function of those partitions. In this way the entire machine can be simulated as early as possible even though some sections are not completely designed. Studies can then be made on those sections which have been designed. Formal System Design: When timing simulation experiments indicate that the system design is satisfactory and unlikely to change greatly, the construction of a complete system simulator describing that design can begin. The design will already have been partitioned. Engineers from the logic design groups assigned to implement these partitions could work along with the architects to write the system simulator. This simulator must be carried uniformly to the latch level of detail in order to be useful in later stages of design. The engineers could see that this requirement is met and that all algorithms specified for latch to latch operations in one cycle could probably be implemented in combinatorial logic without breaking the machine cycle. There is experience in ACS with this sort of simulation, where a number of engineers write the program rather than having a simulation programmer do it. See Reference 4. Note that this production of the system level design by both architects and engineers blurs the traditional boundary between the two functions. Both groups of designers work on the system level design, but from different orientations. much information will be fed back to the architectural stage and force revisions in the system description. For example, many algorithms will not turn out to be realizable in logic in one cycle, and will have to be respecified, changing the system description. This system description must be accurately maintained if the design process as described in this memo is to function properly. (i)Accurate performance prediction- -potential users, compiler writers, etc., can run code on this simulator and predict machine performance and optimize their programs. (ii) The logic design of the machine will proceed directly from the high-level description and thus will progress more rapidly and with better communication between design groups working on different partitions. (iii) An effective logic simulation can be performed to compare the logic design of a partition with the system specification of that partition. The system level simulator can produce the input/output signals on the partition interface which can then be used to "drive" the logic simulator. More will be said about this very important logic simulation later in this memorandum. (iv) Accurate system simulation plus accurate logic simulation will make possible the implementation of a very effective maintenance plan. This will be described later in this memo. See also Reference 6. The significance and importance of the system level simulator cannot be overemphasized. It must be produced and maintained for the proposed scheme to work. The higher the level at which a design is formally specified, the easier it is for everyone involved to fully understand the design, experiment with it, and change and debug that design. This system level simulator should really be viewed as "the machine". All later design and automation of design and manufacture should be viewed as implementations of the system design. This stage of the design process produces an implementation of the structure and function of the architectural design in the logic circuitry and physical package of the chosen technology. In a manner similar to the system design, the logic design and engineering pass through two phases: (i) a tentative phase where attempts are made at implementation, often resulting in revisions being made in the system design, and (ii) a formal phase where the formal description of the logic and physical placement is produced. Tentative Logic Design: When a partition of the system has completed tentative system design and is ready to be formalized in the system level simulator, then the tentative logic design of that partition may begin. The tentative logic design is the attempt at implementation of the system partition in logic circuitry and package. These early attempts will fail because many of the system algorithms will not be realizable in one machine cycle of logic. A strong interaction must exist between those persons producing the formal system specification and the logic designers. The tentative logic design efforts must feed back enough information such that the formal system description will have most of the algorithms checked for feasibility of implementation in logic and package without breaking the machine cycle time. For this reason it is suggested that at least one of the logic designers who works on the tentative logic design of a partition also work along with the architect for that partition and participate in the formation of the system level description. In this way the partition of the system will not only reflect architectural requirements, but will be implementable, as described, in logic. These early, tentative logic design and placement efforts will probably be specified nonformally. The designs at this stage are traditionally sketched out as logic circuit diagrams on "yellow sheets". Rough. approximations of circuit placement can be made, and then estimates of delays and circuit counts can be generated. These estimates will be fed back, and perhaps modify the system design and/or the logic design. Formal Logic Design and Placement: When tentative logic design studies have produced sufficient feedback to finalize the system design, then the formal logic design and placement can begin. The formal logic design must implement in logic circuitry the function of the system design. The behavior of a partition of the machine, as seen at its interfaces, must be the same at both levels of design, system and logic. There are two aspects to this implementation of the system design: the implementation of the system function in logic circuitry and the mapping of that circuit design onto real hardware. Currently the logic design phase is done by the designer with no computer assistance. The mapping of the logic design onto hardware and the placement of the different levels of hardware may be done in part, or perhaps entirely by computer programs. The mapping or partitioning of logic circuitry onto hardware and the placement of levels of hardware involves the following levels: logic circuitry maps onto circuit chips, circuit chips are placed on MCM's, and MCM's are placed on the board. (i) In current use is a method where the designer must partition the logic onto chips by hand, and then a sequence of computer programs places the chips on MCM's on the board. (ii) In development is a placement system which will require that the designer merely partition the logic among MCM's. The selection of chips, assignment of logic to chips and placement of chips on MCM's on the board would be accomplished by computer programs. See Reference 5 which summarizes Dr. U. Kodres' work in this area. (iii) It may eventually be possible to have the partitioning of logic among MCM's be automated also, thus automating the entire partitioning and placement process. Mr. R. Goldberg is working on this partitioning algorithm. Also, Research has developed a program, ALMS, which may be applicable. These three placement schemes are summarized in the flow charts in Figure 3. Formal Description of Logic Design/Placement: The output of the formal logic design and placement is a formal description of the design at this level. The language in which this description may be placed is the DRKS input language. DRKS is the design record keeping system which files the logic design and placement information. An unfortunate aspect of the DRKS language is that it imposes a totally arbitrary level of partitioning on the design description: the ALD sheet (logic diagram sheet). The design is input to DRKS by drawing logic diagrams on sheets of a fixed size and then describing the drawing by statements in the DRKS language. This partitioning onto sheets is usually too fine to correspond to any useful design partition. The designers partition of the machine and even various functional entities within that partition will contain logic circuitry requiring many, many ALD sheets to describe. The language used to input DRKS is awkward to use, and describes the sheets rather than the logic directly. The statements of the language are usually formulated by someone other than the designer, who merely sketches the sheets. It is strongly suggested that an alternative Logic Description Language (LDL) be developed and used so that the designer can more easily specify his logic design in a formal language. In this way the processing and understanding of the logic designs might be improved greatly. Dr. J. Cocke has proposed a tentative version of such a language. Dr. R. Love, Mr. P. Shivdasani and I are now working on completing the specification of this language. An important reason for the use of sheets as the formal logic design description has been the traditional use of these sheets by CE's who maintain the hardware. As we shall see later in this memorandum (Section 6), the importance of the sheets may be reduced because their use by CE's can be minimized by using improved maintenance methods. If the ALD sheet were needed, perhaps in some central maintenance facility, a form of ALD sheet could be generated by program from the design files formed from LDL input. Thus there is no real reason for requiring that the design be specified by sheets initially. when someone really needed to look at them. Logic Simulation: When the logic design of a partition of the machine has been completed and formally described, it is very desirable to verify that the logic design correctly implements the architectural specification of the partition before going any further into the design automation and process automation phases. An error found at this stage will be much easier to correct than if found later on. This verification of the logic design is performed using a logic simulation program. A partition of the design can be simulated on this program. Input signals are supplied at its interface and the logic simulator produces the output signals at the interface. The major problem in this sort of logic simulation is the generation of test cases of interface input signals and expected output signals. The generation of a large enough set of such signals to moderately debug a partition of logic would be a very costly process if done manually. It would probably be possible to generate only a rather small number of such tests. There is a solution to this problem. If the system level simulator and logic description of a partition are really different levels of description of the same entity, then they should behave the same at the partition interface. Thus it would be possible to run a program on the system level simulator and store all the 1/0 signals on a partition's interface while the program is running. Then these signals could be used to input and compare against the logic of the partition when it runs on the logic simulator. In this way many tests could be automatically generated. The tests would be consistent over the whole machine; if we debugged the logic of all partitions on a given program, then when we put all partitions together later, they might all function properly together when running that program. This idea of using two levels of simulation to debug the logic design has been extensively studied and described in an earlier memorandum. See Reference 3. 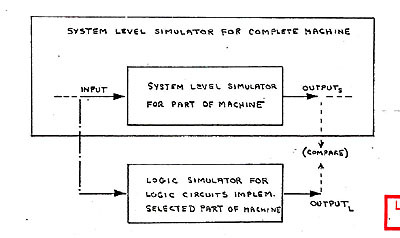 Figures 4 and 5 graphically portray the idea of a Logic Simulation System (LSS) using two simulators: a system simulator which provides input/output signals for the partition which runs on a logic simulator. Suppose we now have a verified logic design along with physical placement information resident in the DRKS files. There is still a long way to go before the machine can actually be constructed. The remainder of the design process is completely automated, however. (i)The records describing the logic design and placement for a board are selected from the DRKS files. (ii)The nets on the board must now be wired. This involves determining the best path for wiring together the points of a net subject to the wiring rule constraints. 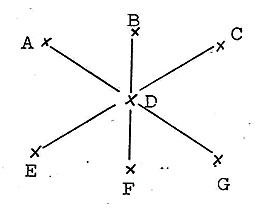 For example, given that points A, B, C, D, E must be wired together we must decide whether to wire as in (a), (b) or some other way. (iii) When the wiring has been calculated for the nets, we must assign the location of terminating resistors for the nets. The actual DA programming becomes somewhat involved because a situation may arise in the later stages of processing which cannot yield a solution, and this will have to be fed back to the earlier phases and a new pass made through the DA programs. After the design automation is completed, we have in a "physical file" the complete physical specification of the boards of the machine. At this point we have sufficient information to perform delay calculations to determine the circuit and wiring delays in various paths through the machine. Computer programs can be written to perform these calculations. Excessive delays will necessitate design changes.. This raises an interesting point: We have proposed four formal specification levels for the design. Thus, we can envision four levels of design simulation: system, logic, "A-C" logic including delays, and finally actual running hardware. Unfortunately, the "A-C" logic simulation, including physical delays, is not really feasible for a machine of the size we are designing. Even the usual logic simulation must be partitioned, and the AC logic simulation includes much more detail. So all we can do at this level is delay calculations on paths through the hardware. It is of theoretical interest however to note that with sufficient machine power a simulation at the physical level could be performed and make this stage of the proposed process similar to the preceding stages in the use of simulation to verify the design. Now, how can the boards (or MCM's) produced by the process automation be debugged? Even if the design at the system level and logic design level is error free, defects or errors may have been introduced in the manufacture or wiring of the circuitry. It is possible to partially debug the hardware in an economical manner by using the two levels of simulators to generate test signals. The signals could be generated as follows: The system simulator can produce input signals for the logic simulator while running a particular program. This would be done for the logic simulation of the partition of the machine which contains the hardware to be tested (usually the hardware would be a small subset of a partition). All of the signals internal to the partition are generated during the logic simulation. Thus the signals at the interface of the hardware to be tested could be extracted, and filed, while running the logic simulator. Of course this method of debugging is only partial. Not all possible input-output test patterns would be generated for the hardware. However, this is a very special form of partial debugging: the same program could be run on the system simulator to generate tests for all hardware components. Thus, although only partially debugged, the hardware will run that particular program when it is all put together. The key point to note is that the partial debugging is uniform over the whole machine. Of course many programs could be run -- the number depending on the economics of the situation. Diagnostic programs could be used for this hardware test generation. Then the machine, when constructed, would run the diagnostics to isolate residual hardware errors under normal maintenance procedures. Note that if each piece of hardware were very thoroughly, but not completely, debugged with traditional methods, there would be no assurance that any program would run when the pieces were put together. Thus, the partial, but uniform, test generation could be a very economical method of quickly getting hardware to the point where it will run at least some programs when integrated into the whole machine. This could serve as a basis for planning the bring-up of the machine. The design process is not completed with the wiring and construction of the computer. A bring-up of the computer must be accomplished and the machine must be maintained. Bring-up may uncover design errors at any of the stages of design. In addition to the correction of hardware failures, maintenance will involve the installation of engineering changes. Thus, both of these activities involve cycling back through the design process and both are strongly tied into the network of simulation and automation programs used in the design process. (a) Diagnostic programs running on the ACS computer detect an error. The program causing the error is identified. (b) The error producing diagnostic- program is repeated on both the ACS computer and on the system architecture simulator running on a smaller diagnostic computer. The ACS computer's latches are loaded out each cycle and compared to the latches of the simulator. The failing latch and cycle of failure are identified. (c) A traceback program is run on the diagnostic computer, operating on the logic files, to find all latches which could set/reset the failing latch in one cycle. This is the latch tree of the failing latch. (d) All scopeable points in the logic of the selected latch tree are found from the design files and output by another program running on the diagnostic computer. (e) The logic of the latch tree is extracted from the design files. A logic simulation of the latch tree is performed for the cycles of interest: the cycle preceding failure and the failing cycle. The scopeable point values are output for these cycles. (f) A technician can now scope the ACS machine at the appropriate points and compare the values with the above values for the cycles of interest. This will isolate the point of error. (g) The technician then decides what unit of hardware to pull and replace in order to correct the failure. (i) The diagnostic computer can be physically distant from the ACS machine being repaired with communication between the two locations handled by teleprocessing. Thus, one central diagnostic computer and maintenance system could maintain several ACS machines in the field. (ii) The person repairing the machine in the held need not be a CE in the usual sense. He could be a technician instead, for no knowledge of the functioning of computer logic would be required to perform repair work. (iii) Because of (ii), it is clear that the distribution of ALD sheets to many CE's in the field would not be necessary. The significance of these sheets is thus greatly reduced. This particular maintenance plan has significant advantages over previous plans. These advantages are bought at a price: dependence on the existence of accurate system architecture and logic simulators. We have now covered all the phases of the design process in some detail. For the sake of simplicity and brevity, the presentation has treated these phases as separate activities which follow each other in a serial manner. (i) Design phases do not follow serially, but overlap in time. For example., the tentative logic design may be proceeding while the formal system specification is still in process. partitions. We might be far along in the design process on one partition of the machine, but only experimenting at the system level with another partition. (iii) There is consistent feedback (as indicated in Figure 2) from later phases of design to earlier phases. Very often the design at a given phase cannot be feasibly or economically implemented at a later stage and must be modified. Therefore this basic plan for the design process must be made considerably more detailed and account for these additional complexities before it is really a working plan for the process. This elaboration of the plan will have to await the feedback produced by this memorandum. In conclusion, it is felt that the suggestions proposed in this memorandum, especially the fundamental uses of the system simulation program, can lead to a workable system plan for the whole computer design process if they are properly elaborated and detailed. A key factor in reaching this conclusion is the existence of practical experience within ACS in the separate phases of the plan. It is hoped that this memorandum will stimulate discussion and new ideas on this subject. Your comments and criticisms concerning the various suggestions made herein are welcomed by the author.